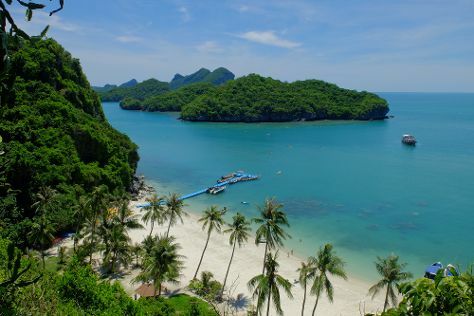 The gateway to the islands in the Gulf of Thailand, Surat Thani Province remains largely unexplored by foreign tourists, despite its centuries-long history and abundance of natural attractions. International travelers who do venture here enjoy sightseeing in Surat Thani Province at their own pace, taking in the "real" Thailand--a section of the country that remains mostly unspoiled by commercial tourism. Add the area's national parks to your Surat Thani itinerary for a chance to trek through lush evergreen forests known for their wildlife, waterfalls, and hot springs. Though they offer plenty of modern amenities, the three main islands in the gulf are remote and wild enough for serious adventurers, featuring rugged slopes covered in virgin rainforests. Surat Thani Province is in Thailand. Put Surat Thani Province at the heart of your travel plans by using our Thailand online trip maker .